Dodge Data & Analytics figures show the Dallas-Ft. Worth market trailing only New York City in 2017 building activity. Over the past decade, the DFW Metroplex has seen annual population growth average 2 percent, netting 1.3 million new residents. MDU Resources Group in Bismarck, N.D., has acquired the operations of Molalla Redi-Mix & Rock Products, a concrete producer in Molalla, Ore., south of Portland. The business joins the Portland Metro office of MDU’s construction materials subsidiary, Knife River Corp., extending its reach in a growing market between Portland and Salem. Vulcan Materials Co. has implemented a chief financial officer succession plan. Effective September 2018, Suzanne Wood will join the producer in that capacity and as senior vice president, succeeding John McPherson, who has served as chief financial and strategy officer and executive vice president. He will remain with the company as chief strategy officer through year’s end. Wood arrives at Vulcan after serving as finance director and CFO of Ashtead Group Plc, an international equipment rental company and parent of Sunbelt Rentals Inc. in North America. Pioneer Landscape Centers, Highlands, Colo., has added Granite Express, an Arizona-based, full-service commercial supply company that owns and operates quarries surrounding the Phoenix area. The deal follows acquisition of Grand Materials & Supply and Midwest Materials, and positions Pioneer as the leading supplier of its kind in Arizona. Specializing in materials such as decorative landscape rocks, aggregate, boulder and unique stone, Granite Express will become a Pioneer division and maintain current leadership and employees as it transitions into the Pioneer organization. Wisconsin-based Spancrete has promoted John Schnell from vice president of Spancrete Machinery to vice president of Precast Operations North, and Nicholas Passint from product development and business development engineer to vice president of Spancrete Machinery. A 33-year company veteran keen to the industry, operational efficiencies and managing a team with diverse skill sets, Schnell will be responsible for overseeing the producer’s Crystal Lake, Ill., and Valders, Wis., precast operations, and based at the latter. 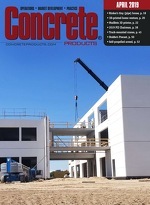 Passint is credited with leading the development of Spancrete’s RePlenish pervious precast system and, from a Waukesha headquarters office, will be responsible for increasing sales of the namesake hollow core fabrication, finishing and handling equipment.